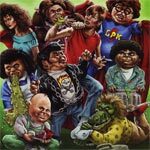 The Garbage Pail Kids Movie is, putting it simply, a crap of a movie. Sure, the film might have its fans in a cultish kind of way and plenty of camp but not in the good kind of way. Beyond that, the costumes and prosthetics are creepier than anything else.